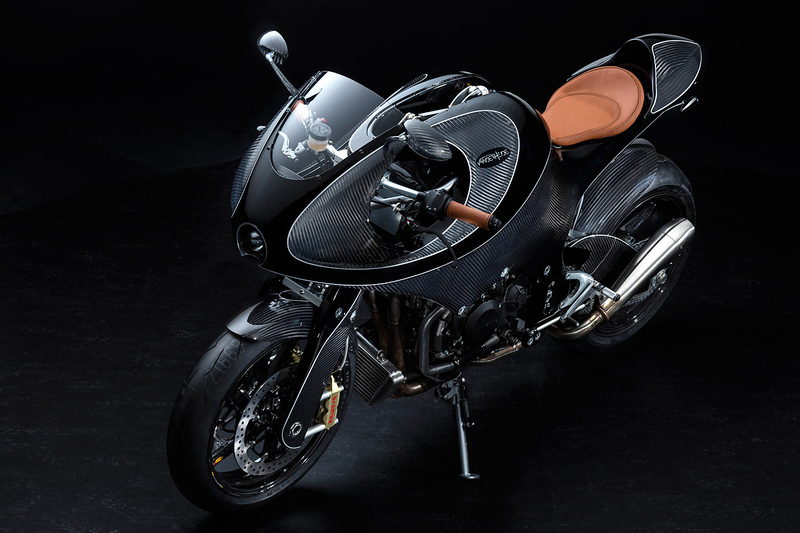 When carbon fibre comes up in a motorcycle spec sheet, it’s usually in the accessories section where you can expect to pay an exorbitant amount of money for a pair of carbon fibre mirrors or number plate stays that save just a fraction of a kilogram. 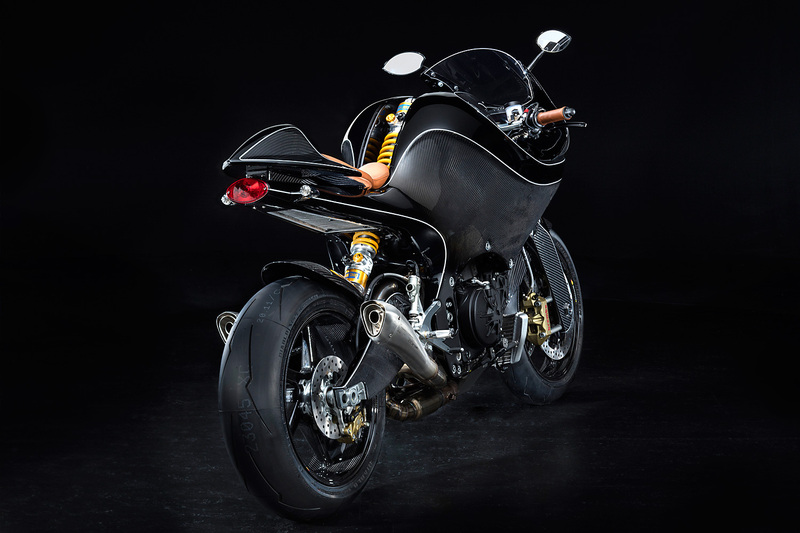 But the Dutch built VanderHeide bike is a different animal altogether; this is motorcycle exotica at its finest and perhaps the most revolutionary machine built since the world-renowned Britten that saw its development cut tragically short by the death of its Kiwi creator. So Dutch brothers Rolf and Sjors van der Heide have picked up the baton and run with it, and the result is a full carbon fibre monocoque framed, superbike engined, centre shock sporting “Gentleman’s Racer” that is taking the world by storm and wowing the crowds at the Goodwood Festival, where world-class machinery is simply a requirement for entry. 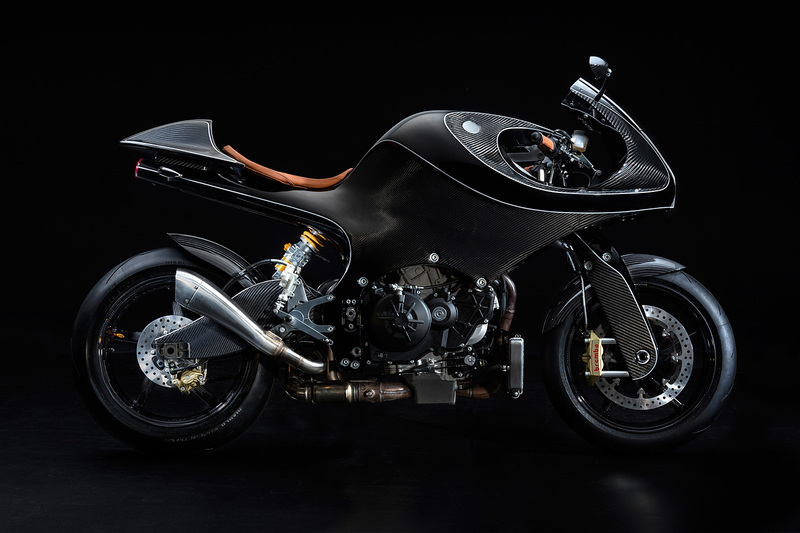 Both brothers are motorcycle crazy who love pioneering, thinking outside-the-box, and have always seen plenty of opportunities to improve upon existing technologies. 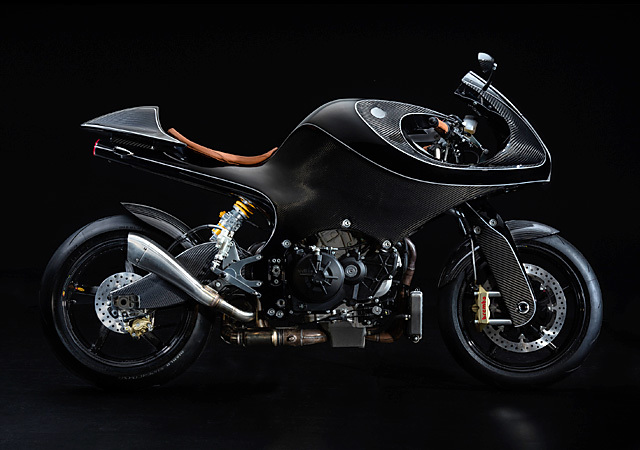 For Rolf he has always dreamed of creating his own motorcycle as long as he can remember and has been involved with various companies, like Dutch supercar brand Spyker, and Dutch car brand Carver and is a specialist in carbon fibre composite engineering. 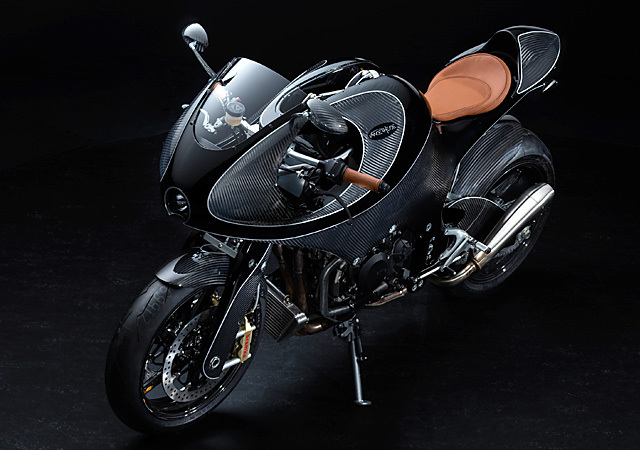 “When we started about five years ago, Rolf had two main ideas: first was to use carbon fibre as the base material, and second was to use his own suspension system. 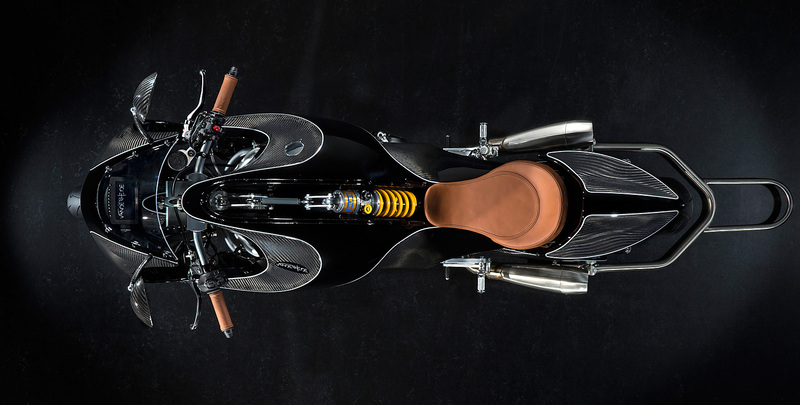 And we knew we wanted to build an attractive and competitive street legal superbike: a Gentleman’s Racer, as we like to refer to it,” explains Sjors. Starting from scratch is no easy task and the brothers invited designer Michiel van den Brink to assist with the initial styling. 2D sketches were followed by a small-scale foam model but it proved impossible to create the level of detail they required. So a full size clay model was designed and shaped, just like the big manufacturers, before a 3D scanner was used to digitalize the design.“This allowed Rolf to design the moulds. We have moulds for the swingarm, the front forks, the mirrors, etc. And the monocoque moulds, of course. These are by far the largest: about 2 meters and weigh about 200 kg.” That monocoque runs from the headlight all the way back to the tail and serves as chassis, bodywork and fuel tank capable of holding a very respectable 24 litres. That a single piece of material can serve so many functions is impressive enough but it’s the way that material is used that is truly revolutionary. The fibre is hand laid in their own workshop and is the exact same material as used by Pagani in the construction of their Huayra. To ensure the curing process, that involves vacuum injected resin, is perfect and repeatable every time a host of data logging equipment monitors temperature, humidity, air pressure and a host of other variables. For most people to design and build their own monocoque chassis to such a world-class standard would be a life time’s achievement and a chance to call it a day and enjoy a well-earned cold beer. But not the brothers van der Heide and the chassis was only one of the tricks up their sleeve. 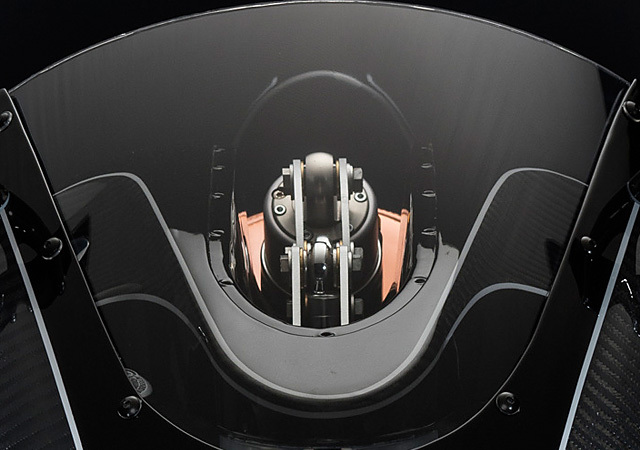 The next revolutionary aspect of the motorcycle was to follow with a suspension setup like no other. 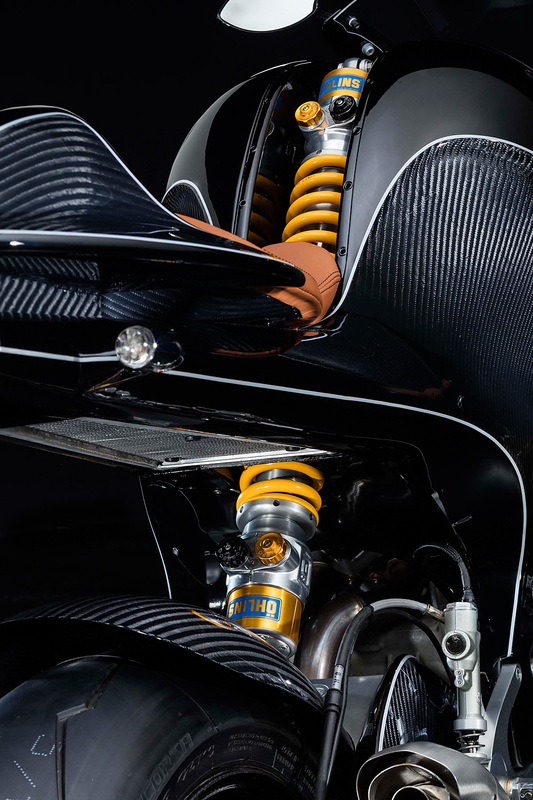 On its own the full carbon fibre girder front end is the ultimate expression of an old design, but it’s the way the dampening is controlled that takes the VanderHeide to an all new level. Where the Hossack/Fior examples keep the shock absorber inside the girder, this example uses a linked double wishbone, which is attached to the front shock via pushrods and rockers. 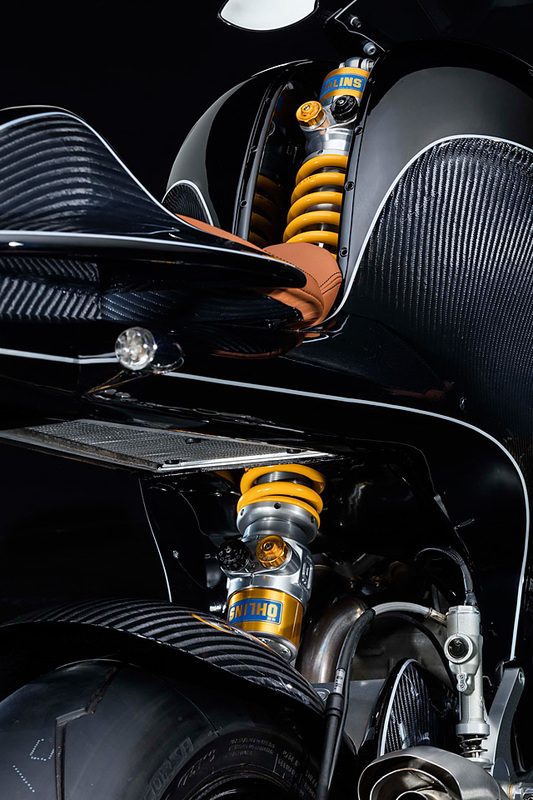 The shock itself is the world leading Öhlins TTX 36 with a second identical unit used for the rear suspension mounted inline but in opposing directions so as to drastically reduce the stress on the chassis. 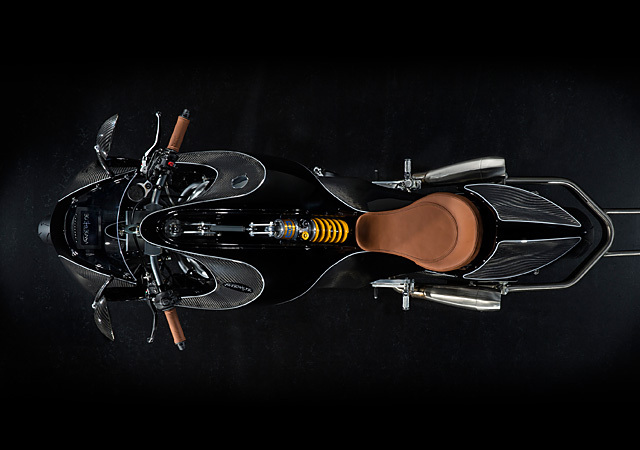 The enormous benefit of the design, for which there is a patent pending, is that when you grab a handful of those enormous Brembo front brakes the bike barely dives. Not only does this allow the shock to use its near full stroke to handle bumps and undulations, but it retains the mass in a central location and keeps a maximum amount of tyre patch in contact with the road surface at all times. Want to make adjustments to the wheelbase, dial in some dive for rider preference or shift the weight distribution? Just pull out a single Allen key and become your own MotoGP engineer. The rolling stock is also, you guessed it, carbon fibre 17” 5-spoke BlackStone Tek (BST) Black Star’s wrapped in super sticky Pirelli Diablo Supercorsa SC rubber. 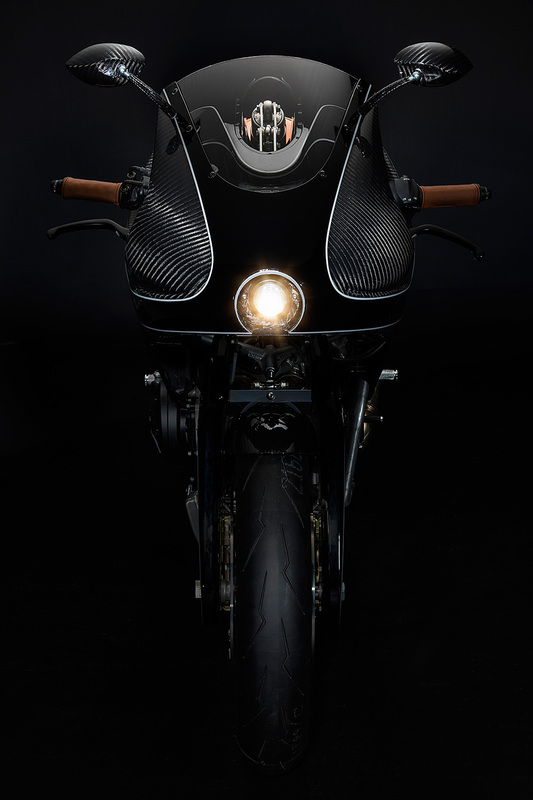 But it’s not all race like technology, a Gentleman’s Racer also needs a touch of class and the handcrafted 100% full grain leather seat and matching grips provide it in abundance. 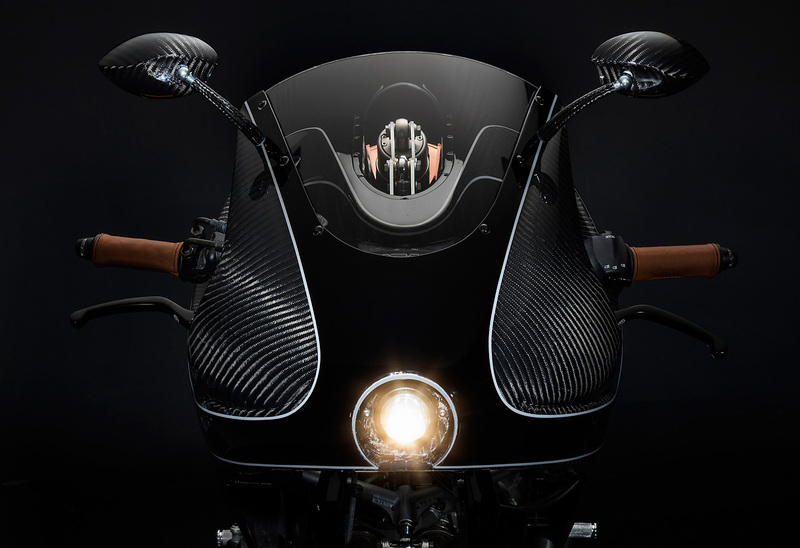 While finalising the status as the world’s first street legal full carbon fibre motorcycle is a range of lighting including Kellermann BL2000 Blinkers integrated in the handle bars. Being a bespoke motorcycle the brothers van der Heide could have chosen to use the engine from just about any modern superbike to power their creation. From the major manufacturers there are at least ten engines that make in the vicinity of 200bhp and there is near parity in the category, but they’ve chosen the Aprilia V4 unit for very good reasons. 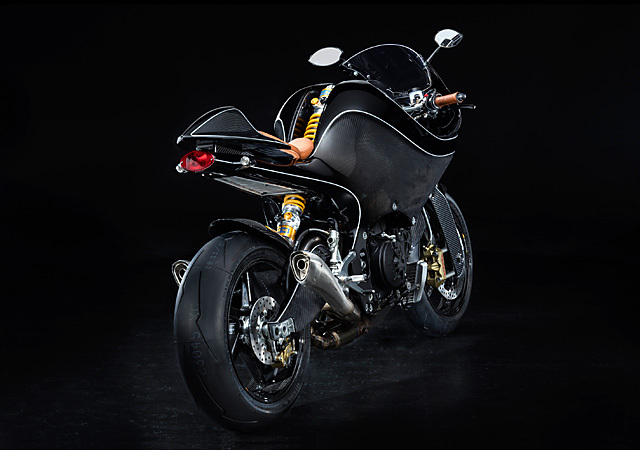 Not only has it powered the Italian firm to WSBK championships and been used for successive years by prototype racers in MotoGP and the Isle of Man, its configuration makes for the most compact of designs and a very lightweight. It also happens to be a stonking engine, with the 999cc, 65° V Four, punching out 201bhp at 13000rpm through an ever reliable straight cut gear box. It’s a phenomenal sounding engine in stock form, but screaming through a HP Corse Pro Series Hydroform exhaust it is simply automotive nirvana. But in case that isn’t enough for you, then you can also tick an option box for a full-blown Aprilia RSV4 superbike engine that gives you more than 230bhp, drops the weight from 175kg to 165kg and you’d better call your local track and make sure the timing gear is working as you’re coming to break the lap record on your 300+km/h black bullet. But even without going for the race configuration the “standard” machine comes with some impressive features including the MoTeC C125 Full Color TFT LCD anti-reflective display to add to the already world leading Aprilia electronics package. The Motec is capable of displaying just about any parameter you care to name and can be upgraded to act as a data logger or full race timer should you wish to use the bike in open class racing or just as a super exotic track day weapon. An optional extra, and if you can afford this bike you’d be mad not to get it, is the Pro-Shift electronic gear shifter which not only allows for flat upshifts but using the supplied software enables a rider to dial in their preferred amount of blip on downshifts. But whichever options you do or don’t check you get an engine package capable of putting such an incredible chassis and suspension package through its paces. The possibilities for the bike are endless and for Sjors he sees just as many for their product as well, “Another interesting path is the fact that our suspension system can be mounted to every kind of chassis. In the future we might build a Gentleman’s Racer with our suspension system in a ‘standard’ aluminum chassis. We would love to cooperate with a partner to build a bike with an electric drivetrain. 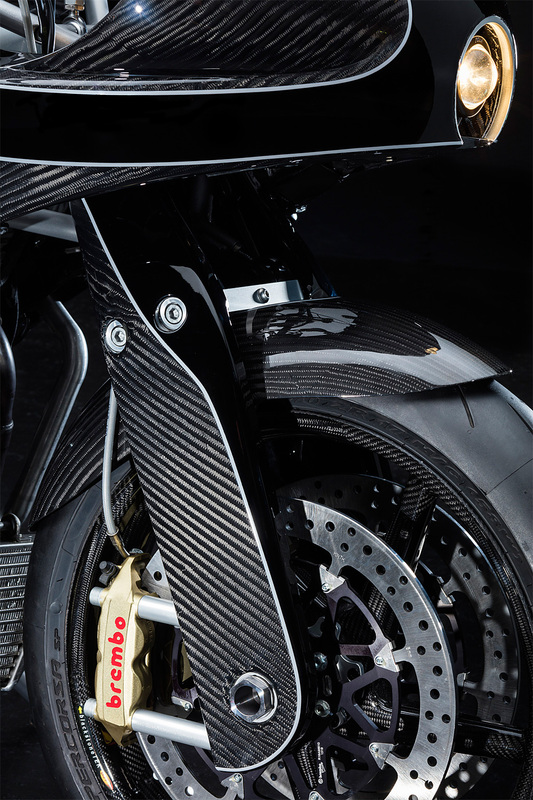 And of course we would like to see our bike on the racetrack as often as possible.” Only time will tell where the VanderHeide story will end, you can buy one of the first 25 now, but given the global excitement about the companies achievements so far it’s likely this is just the first of many Dutch built carbon kings to follow.